Fred the motorized Go! Go! 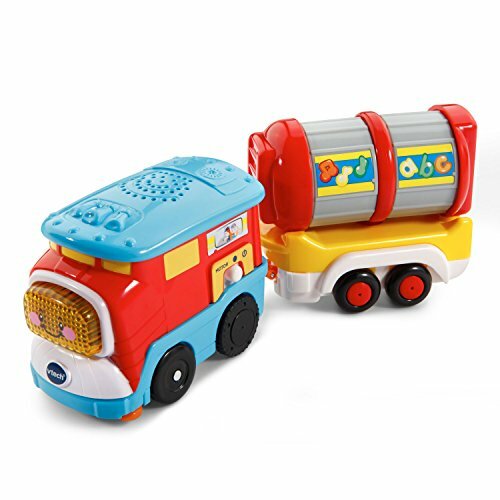 Smart Wheels Freight Train by VTech loves chugging along with heavy cargo. Your little conductor can press the light-up button to hear sing-along songs and learn the letter F or push him along to play cheerful melodies and sound effects. Pretend to fill up the detachable tanker car by spinning the tanker's drum to develop motor skills. This cute little train also responds to SmartPoint locations on Go! Go! Smart Wheels playsets (sold separately) with fun phrases, music and more. It's playtime with miles of learning! Requires 3 AAA batteries (batteries included for demo purposes only; new batteries recommended for regular use). Intended for ages 1 to 5 years.